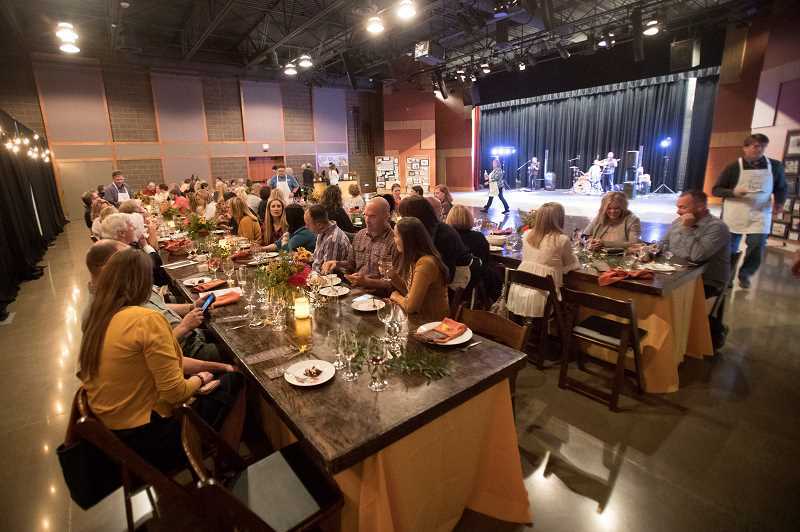 The city marked a major milestone with a festive farm-to-table dinner at the Center for the Arts. In July of 1993 — the year Sherwood turned 100 years old — Independence Day firework displays were canceled throughout the Portland area, thanks to a slew of heavy rainstorms. Later that year, those July lemons became Sherwood's lemonade. The city celebrated its bicentennial with a big parade and celebration, culminating in a firework display. The vendor had a backlog of unused fireworks that would have gone bad by the next year, so he used them all for Sherwood's 100th birthday. "We had scraped together some money for what was supposed to be a 20-minute firework display," recalled Jim Rapp, who served as Sherwood's city manager from 1984 to 1995. "It ended up being an hour." This past Sept. 13, Sherwood turned 125 years old. There weren't any fireworks this year — but there was a farm-to-table dinner and celebration in Old Town, at which about a hundred people gathered to commemorate the milestone. The celebration was originally supposed to take place on Railroad Street, but got moved to the Sherwood Center for the Arts due to last-minute weather concerns. It was organized by Sherwood Main Street and funded by the City of Sherwood. The farm-to-table dinner was organized by Fat Milo's Kitchen, and featured food from many different Sherwood vendors. The dinner, served by city councilors and city manager Joe Gall, consisted of baked chicken, pesto, beans — in a nod to Sherwood's history as a cannery town — and "tomatoes come six different ways come Sunday," according to June Reynolds. Reynolds, the town's resident historian, came dressed in traditional 1890s garb to honor the town's origins. "This is a bit of a Victorian outfit, and it doesn't have the fancy bustle, as the women in the city would where," Reynolds said of her simple cotton and lace dress. "This was more of a practical, out-West fashion. You only wore the bustle if you were going somewhere fancy." Reynolds has centered her life around recognizing Sherwood's history. She runs the Sherwood Historical Society and has written several books about the town's history. "It takes us back to tradition," Reynolds said, when asked about the importance of recognizing Sherwood's roots. It connects us with people, so they feel like they have a sense of place here. … This used to be an agricultural town, so to know a little bit about your past connects you with your present." Compared to other towns in Washington County, Sherwood has especially strong ties to its past, thanks to a well-preserved Old Town. "Some of this was by accident," Reynolds said. "In the 1950s, Highway 99 took over the traffic conduit from the ocean to Portland. And when it did, this became the little town that time forgot, because it was off to the side of the traffic." Rapp remembered that when he was city manager, Sherwood's population hadn't grown much since the 1910 Census. There were 2,300 people when I moved here," he said, and the area had seen very little development. "I think the first year I was here, we issued about 10 building permits. … Nothing ever changed in Old Town, because there was no economic incentive to change anything. So come the 1980s, it looked pretty much like it had looked in 1910." Rapp looked around at the Sherwood Center for the Arts, which opened in 2015. "I couldn't even imagine stuff like this," he said. Sherwood has seen a lot of change and population growth in recent decades, but its dedication to preserving Old Town, and its small town feel, remains strong. As the dinner ended, before the band started playing and folks headed out to the dance floor, Mayor Keith Mays read a prepared statement. "We encourage everyone to learn as much of our history as possible, because it not only helps develop a sense of hometown pride, but the knowledge of where we've been and how we've got here evokes feelings of respect and awareness for our surroundings," Mays said. "We become better citizens when we know about our history."